I'm completely split on this question. So I'd like to hear what the intelligent answer is. Does street graffiti have any value? Yes or no? And why do you think that? Re: Has street grafitti got any value? Banksy will tell you it has a lot of coin value. I must admit I'm also split on this one - your example is quite funny as is some others I have seen, but probably not as humorous if you have to remove it from your own wall and so that has the value of, well, of being funny, which is something in itself. However, just seeing a rude word, or string of them, or just, for example, someone's initials daubed about in a dribbly trail of spray paint really only has value to whoever did it (we all want to leave our mark on the world). But on the third hand there is that which takes skill, as most here know, I'm a useless artist much to my chagrin and so those who produce the fantastic stuff that you see in some places, to me, are very talented and it has value - again, this is speaking from not having to remove it from any of my walls. I agree and I sort of disagree... I don't know if anyone has ever calculated what % of graffiti is absolute kerrap and what % has real 'artistic' value. But I reckon it'd be way low. The yardstick I use is whether the graffiti acts like an improvement or acts like a 'visual pollution' and immediately 'slumifies' the area. This, I reckon, is the effect of most graffiti - it slumifies whole neighbourhoods. OK, most of it's done by well-intentioned yobboes but usually that slumification irrevocably devalues the area - and that in turn leads to less and less pride in the neighbourhood which in turn leads to...you see where I am going. 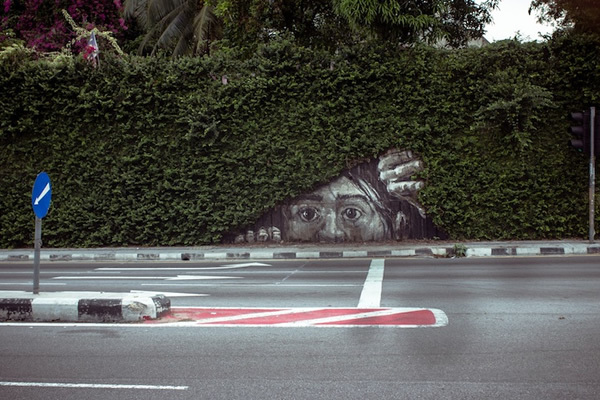 Has anybody ever seen any graffiti that actually improves a neighbourhood? I rate the bottom two, Heels...but that top one? I'd rather wake up and find that someone had grafittoed a Mona Lisa or an Egon Schiele face instead of that teenager's idea of art on my neighbour's wall. Why do so many graffiti artists go for the cheap, crude and grotesque? Some kind of 'protest' art that falls on deaf eyes? I know, I suppose it's the want to make a statement - we all like what we have to say on a subject to be heard. 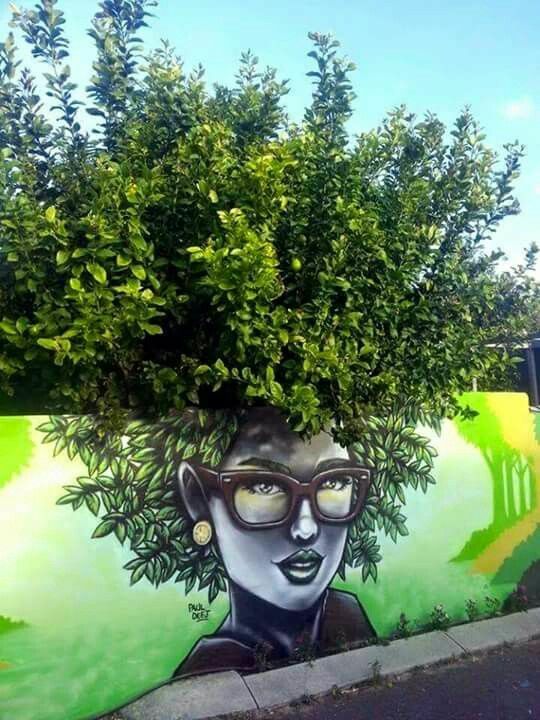 Perhaps not knowing what the trees behind the wall were growing out of just made the artist think that we all go back to the ground and depicted that in their own way. It's not my taste either, but I can't deny the artistic ability of it in any way. Fully agree, Heels Like you, I may not actually like it but I do admire the technique and skilled brush handling. With such skills it's a shame the painter didn't go for something a lot less tacky. I can't help thinking that someone should give the artist a well aimed thump round the ear and explain that there is more to be gained from subtlety than crassness. Probably never happen though. NEWSFLASH! 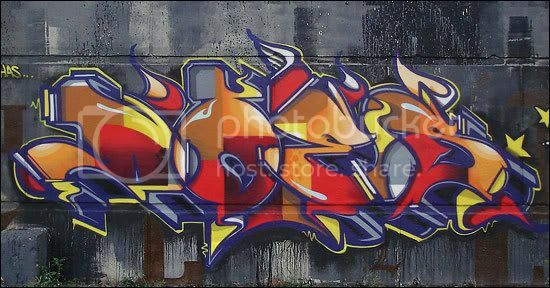 Just found a website that more than answers the question "Has street graffiti got any value?" To see almost 100 more examples go to the link below. After the first 10 pics keep clicking on 'Show More'. Proof at last that graffiti doesn't have be crass and puerile. Subtlety has its own clout. Art in the previously sad and bleak city? While art galleries make a mint on unmade beds and half a pickled sheep, I wouldn't hold my breath.